Abundant stories, photos and fact sheets on stingless native bees by Russell and Janine Zabel. Tetragonula carbonaria (previously called Trigona carbonaria) and Austroplebeia australis nest sales. Boxing and nest rescue services. Great photos and information about stingless bees and their honey and propolis by Dr Tim Heard. Hive sales and beekeeping resources. Share and discuss your native bee sightings on the BowerBird community website and contribute to Australia's knowledge of our native bees. 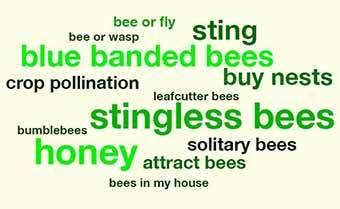 Upload photos and videos of bees and browse the postings of other bee-watchers. Great articles and photos on native bees compiled by passionate native bee promoter, Dr Megan Halcroft. Wildthings is an exciting program by Peter Clarke in the Ku-ring-gai area of Sydney which promotes caring for native animals including stingless bees. FAQ page on Tetragonula carbonaria. See spectacular photographs of Australian native bees, birds, mammals and much more on Erica Siegel's Wildlife Photography website! Erica's delightful images have been featured in many Aussie Bee photo galleries in recent years. Her contributions are greatly appreciated! The Wheen Bee Foundation promotes public awareness of the importance of bees and supports research on both commercial honeybees and native bees in Australia. They have generously loaned Aussie Bee equipment to help with our revision of the Austroplebeia stingless bee species. Photos and interesting facts about a wide range of Brisbane insects. An excellent photographic gallery on Tasmanian insect species. Meet giant litter bugs, rhinoceros beetles, flower beetles, large stick insects, mantids, water bugs, butterflies, the giant Hercules moth and many more fascinating Aussie insects. An article on why native bees are vital for the future of Australian agriculture. Comprehensive information on insects in a colourful and fun way. Presented by Earth-Life Web Productions. This site also has excellent pages on: Solitary Bees and Social Bees including the Stingless Bees. At the Social Insects Lab, Dr Ben Oldroyd's group is studying the behaviour and genetics of social insects including Australian stingless bees. Dr Katja Hogendoorn, Dr Remko Leijs, James Dorey and their colleagues are involved in a range of native bee pollination and species research projects. In 2019, for instance, they announced the discovery of 26 new native bee species in the Australian outback. Research underway at Western Sydney University is exploring the use of native bees for crop pollination and colony health issues for native bees. Dr Terry Houston has made many exciting discoveries about the unique native bees of Western Australia.The Museum Entomology Factsheets contain fascinating accounts of a number of WA bee species. The Australian Native Bee Research Centre published a major revision of the species in the stingless bees genus Austroplebeia in 2015 with Dr Claus Rasmussen. A guide to this paper can be found in Aussie Bee Online Article 25. The Australian Native Bee Research Centre published a major revision of the species in the stingless bees genus Tetragonula* in 1997 with Professor SF Sakagami. A summary of the paper can be found at this link. The Pollinator Paradise website covers bees such as hornfaced bees and blue orchard bees with suggestions for school science projects. This page describes the uses of native bees for fruit growers. Native mason bees are used by backyard gardeners in Canada for pollination. Small wooden bee houses provide nesting sites for mason bees and other solitary bees. Mason bees have similar nesting habits to Australian resin bees. Find out how to attract butterflies, frogs, lizards and birds to your garden at the comprehensive Flora for Fauna website. Find out the best plants to use in your local area and print out great fact sheets on soils, native plants and wildlife visitors. This site also offers detailed reference lists and answers to common flora and fauna questions. Explore photos and records of animals and plant species throughout Australia -- find out exactly which species are found in your area. You can also contribute photos or join in Citizen Science projects in your area.